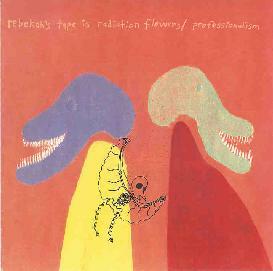 Rebekah's Tape - "Is Radiation Flowers / Professionalism"
Here is another from Intangible Cat, a double album by Rebekah’s Tape. Professionalism has its hand in the fires of minimalism and it stretches fingers through instrumental improvisation. The slow moving tempos bridge faster elements, the lack luster vibe is mingled with their impermeable minds, it produces outings into a void that Pink Floyd trod or rather created. Not as provoking as Pink Floyd mind you, rather treading way way behind. The idea’s are woven solemnly throughout, they press the skull to submit or turn it off, that is the choice. Once you have been acclimatised to the rigour, the journey is long, it is a weary path. I know because I’ve strapped myself in and persisted for your reference. The people behind this are Shawn Cummings, Randy Salz, Cory Bengtsen, Michael Richards and Dustin Freeman. Some of these people are featured on other recordings by The Racing Pisshorses and The Light Bulbs, both of which I have reviewed as well as this one. The aspects of the music on Professionalism lie in improvisation, and as I listen the tempo is the same from start to finish. There is very little to indulge in, the beats are slow and locked there. The whole Professionalism CD made me ache for a change in scene, it was over 50 minutes, so I had to endure a lot. The 7 tracks were not my cup of tea, I thought it bland stuff with no feeling, no raw energy. I hoped Is Radiation Flowers would offer me something more. It did, and it started promising. It gave me a glimpse into the songwriting. The music is a lot more thought out, it made some sense. I could see some sort of style evolving. Could this be what they really sound like? There are elements of The Cure or maybe The Mission in places, sort of almost gothic. It plays a hell of a lot better than the noise stuff, even though there is a lot on here as well. You have different tempos, other things to keep it moving. I can almost feel something. Is it passion or energy? Whatever it is, it is there and it stands out. It is not as one-dimensional as Professionalism. I still do not rate it though, I just think it is better than Professionalism. For more information you can visit the Intangible Cat web site at: http://www.intangiblecat.com. Contact via snail mail c/o Intangible Cat; PO Box 232; Minonk, IL 61760-0232.